Made for progressing juniors aged 7-10, the Dunlop Play Mini Squash balls are part of the second development stage of the Dunlop Mini Squash programme. They are great for kids who want to develop basic squash skills and offer a medium high bounce for easy playability. These medium-sized balls have a diameter of 50mm (1.9”) and come in a pack of three. They are supplied in an orange colour. for submitting product information about Dunlop Play Mini Squash Balls - Pack of 3 We aim to answer all questions within 2-3 days. 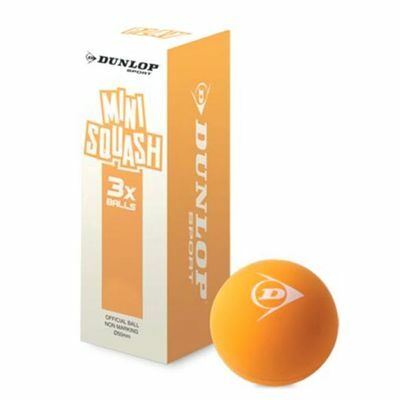 for submitting product information about Dunlop Play Mini Squash Balls - Pack of 3. We aim to answer all questions within 2-3 days. If you provided your name and email address, we will email you as soon as the answer is published. Great balls. Exactly what my daughter needed. for submitting product review about Dunlop Play Mini Squash Balls - Pack of 3.